In A Murder of Crows, Susannah, a young girl, escapes her humiliating life by resorting to meteorological prophecy: surely, some change in the weather is imminent (and immanent)! The tedium she hopes to transcend is her and her mother's hopeless dependence on a vulgar, but rich Aunt and Uncle and an America mired in hate, hoohah, and war. After a strange encounter with her long-lost father (who may or may not be dead), she gives up on the nation of Rational Biped, and goes off to live among the crows. The Hyacinth Macaw is the chronicle of Susannah's second family (are they crows or not? ); alas, a whole other set of sinister but similar problems arises up out of the gloomy mists of Bug River as it transverses the upstate backwater of Gradual. A stranger appears, with two stranger messages—the latter bordering on the Apocalyptic. Both produced at Primary Stages in New York, these plays may be thought of as parallel universes reflected in a shattered glass on a moonlit night, darkly. 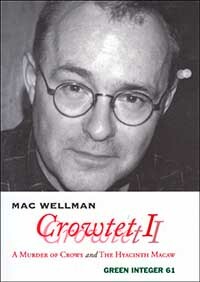 Author of over thirty plays, including Bad Penny, The Professional Frenchman, Crowbar, 7 Blowjobs, and Sincerity Forever, Wellman is the multi-talented author of the novels, The Fortuneteller and Annie Salem, and several books of poetry. He lives in Brooklyn, New York.